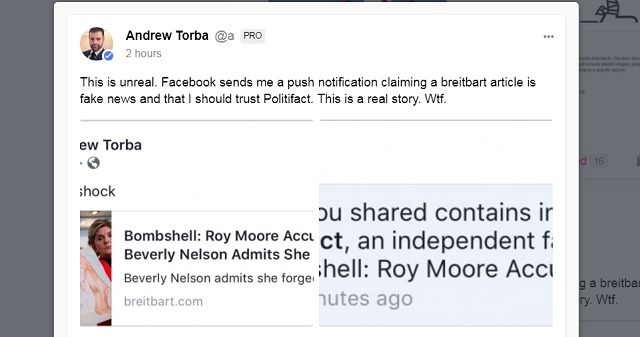 Facebook is suppressing the bombshell news of Roy Moore accuser Beverly Young Nelson "admitting she forged" parts of her yearbook inscription that she claimed was signed by Roy Moore. According to Nelson's lawyer Gloria Allred back in November, Nelson said she "is willing to testify under oath before the U.S. Senate that there has been no tampering." 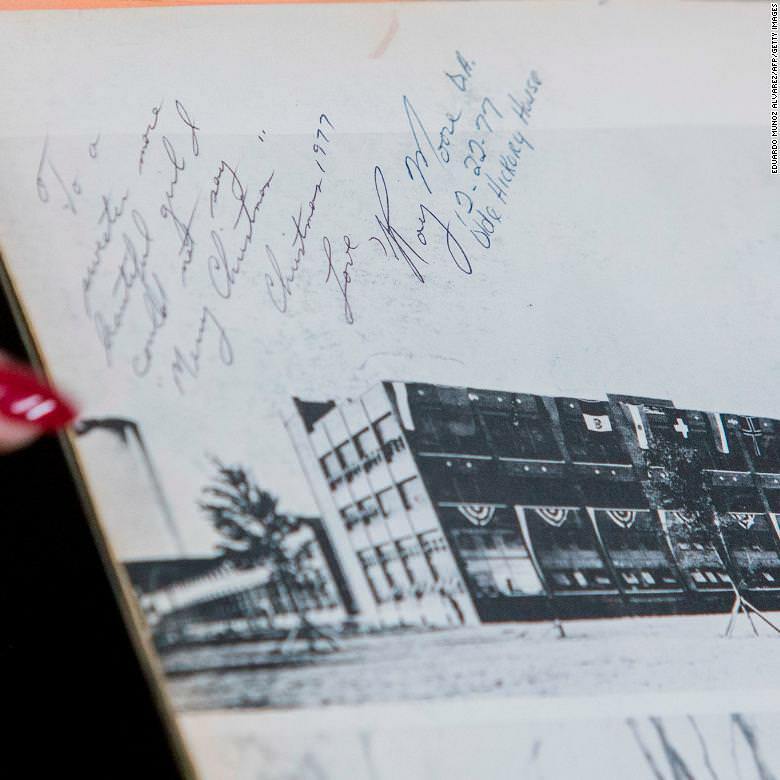 Nelson said in her initial statement with Allred that Moore wrote the entire inscription in her yearbook. "He wrote in my yearbook as follows," Nelson said. "'To a sweeter and more beautiful girl I could not say Merry Christmas. Christmas 1977. Love Roy Moore, Olde Hickory House.' And he signed it 'Roy Moore D.A.'" And in yet another blow to the credibility of ABC News, the disgraced, left-wing network downplayed the bombshell by presenting this admission of forgery as adding �notes� to the inscription. Worse still, the reporter actually coaches Nelson, puts words in her mouth, downplay the enormous significance of her deceit. �Beverly, he signed your yearbook,� ABC News reporter Tom Llamas says. �He did sign it,� she replies. 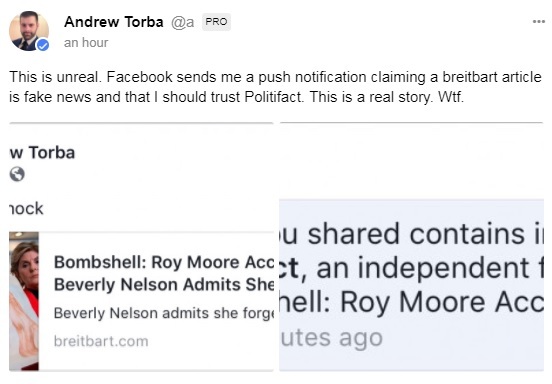 This is quite possibly the biggest bombshell admission of the year, nonetheless Facebook is censoring the story because the partisan hack "fact checkers" at Politifact proclaimed it was a "pants on fire" lie and fake news. Politifact's article "debunking" the story [archived here] is the epitome of fake news and an indictment on their entire organization. If Poynter had any integrity (fact check: they don't), then they would kick Poltiifact out of their International Fact-Checking Network for violating their "fact-checkers' code of principles." A conspiracy-minded website attempted to cast doubt on evidence presented by one of eight women who accused Roy Moore of sexual assault in a misleading headline days ahead of the Alabama Senate race. Note, they start with biased contextualization to downplay the significance of the admission. "WE CALLED IT! Gloria Allred Accuser **ADMITS** She Tampered With Roy Moore's Yearbook 'Signature' (VIDEO)," the headline reads on The Gateway Pundit. 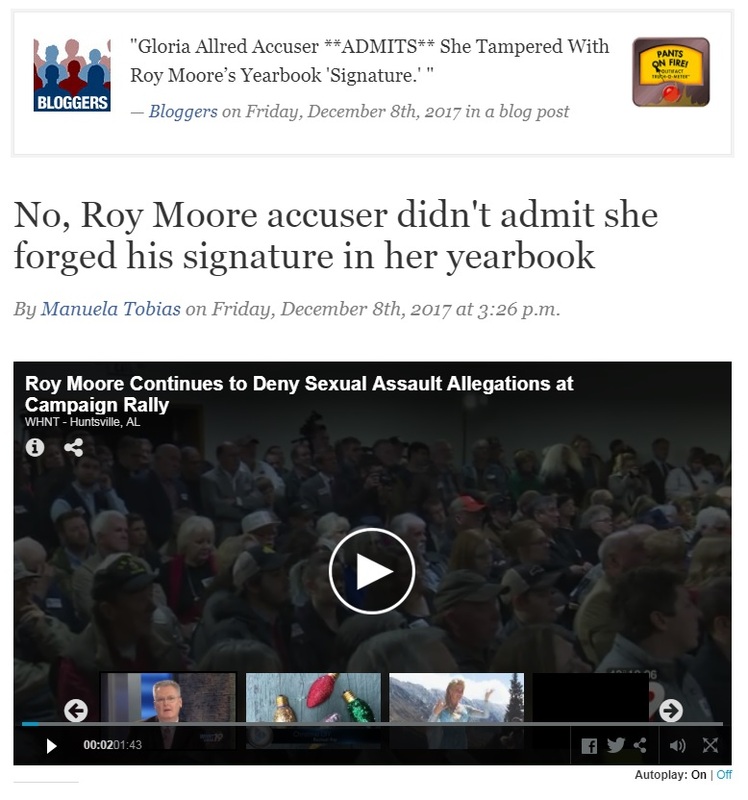 We found similar posts on Breitbart, "Roy Moore Accuser Beverly Nelson Admits She Forged Yearbook," and on the blog Silence is Consent, "Roy Moore accuser admits she forged yearbook inscription." Beverly Young Nelson accused Roy Moore of groping her when she was 16 years old and he, in his 30s, was the deputy district attorney of Etowah County. As evidence, Nelson presented a note she said Moore wrote in her high school yearbook before the incident took place. Nelson has been represented by celebrity lawyer Gloria Allred. The inscription reads, "To a sweeter, more beautiful girl I could not say Merry Christmas. Christmas 1977. Love, Roy Moore, D.A." Below the signature reads 12-22-77, Olde Hickory House. Moore's defenders have pointed out the date and place seem to have been written in different ink and handwriting than the note. Click the articles. Read what they say. They say the signature was forged because they took one look at the pictures of the signature and saw the right side is a different color, is misaligned with the left, has the date twice, and is written in a different handwriting. 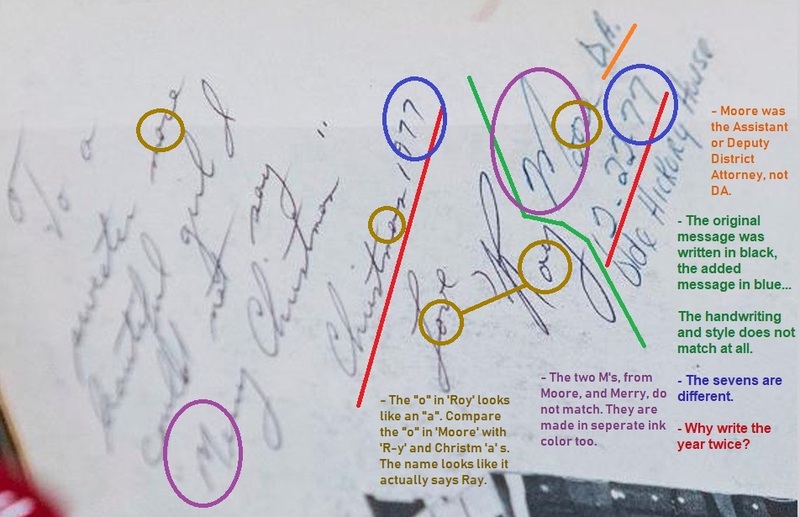 The "Moore" part of the signature is in a different color and misaligned with the "Roy" part. The articles note they believe the signature itself is a fraud. Politifact completely misrepresents their argument and says they only question "the date and place." In a Dec. 8 Good Morning America interview with Nelson about Moore's response to the allegations (he denies them) and her experience since taking her story public, Nelson addressed the inconsistency. Nelson said she added the date and place of the inscription. "He signed your yearbook?" ABC News reporter Tom Llamas asked Nelson. "He did sign it," Nelson said. "And you made some notes underneath?" Llamas asked. "Nelson said she did make notes to the inscription, but the message was all Roy Moore," the video voiceover says. To summarize, Nelson says she added the time and location to the inscription. But she says the note and signature was from Moore. Note there's no source for Politifact's claim. She concurred in the coached interview she "made some notes underneath." That's not what the headlines of the Gateway Pundit, Breitbart or Silence is Consent. All three say Nelson said she either tampered with Moore's signature or forged the inscription. There's no evidence of that. Yet, the Gateway Pundit wrote that "Nelson admitting that she added to Moore's alleged signature is the final nail in the coffin," the story reads. "Allred's accuser is nothing but a fame-seeking fraud." The Gateway Pundit's headline reads "WE CALLED IT! Gloria Allred Accuser **ADMITS** She Tampered With Roy Moore's Yearbook 'Signature' (VIDEO)." But Nelson does not claim she tampered with Moore's actual signature. She said she added a time and location below the signature. Nelson still attributes the note and signature to Moore. She claimed she did not tamper with the yearbook, then admitted she did. One look at it shows it's a different color ink, misaligned, and different handwriting, yet according to Politifact there's "no evidence" the signature or the inscription was tampered with. This is the definition of fake news. Partisan leftists' fake news is being used to suppress a bombshell real news story which could sway an election. If you needed any more evidence this entire "fake news" scheme was nothing more than an excuse to suppress real news which makes Democrats look bad, look no further. As I said before, if Poynter has any integrity then they should kick Politifact out of their International Fact-Checking Network for violating their stated fact-checkers' code of principles.